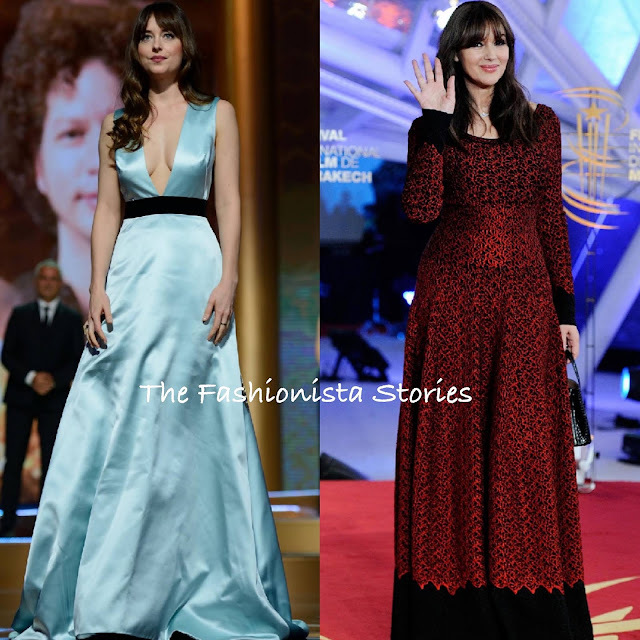 Dakota Johnson and Monica Bellucci were on hand for the closing ceremony of the 2018 at the Marrakech Film Festival yesterday evening(December 8th) in Marrakech, Morocco. Dakota Johnson wore a custom light blue GUCCI satin gown with a deep v-neck and contrasting black velvet waistband. While the gown looks plain in the front, it's the details in the back that keeps it interesting. The back features a deep v-neck, a red embellished heart on the waist and a silver glittery arrows cascading down the skirt and flows into a train. For me, I want to flip this dress around because I feel like the back should be the front and the front should be the back. Given the fabric, the creases were inevitable, which is unfortunate. Monica Bellucci has somewhat of a predictable style, because for the most part, she is either wearing Dolce & Gabbana or Azzedine Alaia. Here she opted for an AZZEDINE ALAIA FALL 2018 dress which we saw on Mandy Moore in September 2018. Her dress was accessorized with a diamond necklace by CARTIER and a black bag, which topped off her look along with light waves with bangs.